The company derives its origin from the union of the ancient lands of the bishops of Florence and from those of the Borromeo family, arrived from Milan in Chianti in the sixteenth century. The combination of these two components of the Florentine Renaissance allowed agricultural development, artistic and cultural district. The cultivation of wine is historical and is currently being developed by the owners who have renovated the old vineyards. Followed by agronomists and wine of great experience, over 7 acres of vineyard, situated in the heart of Chianti Classico, the most typical was replanted native grapes, Sangiovese, along with other complementary varieties. The rocky terrain, microclimate and favorable exposure, the careful work in the cellar have already begun to express itself in ‘only wine that is bottled for the time being, a harmonious and intense Sangiovese. From the ancient olive variety with their good names, Muraiolo, Leccino, Pendolino and others will be crushed by the distinctive olive flavo. Idela place to discovery ancient historical sites and many interesting food and wine tours in the ancient places production of Chianti wine. 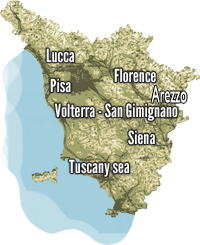 The proximity to cities like Florence, Siena, Volterra, S. Gimignano and many more, all within a short time for the central location in Tuscany, will give lovers of culture and art a holiday full of emotions. To stay in Chianti Charming Hotel Romantic rooms that retain the charm of the original structure dates back to the sixteenth century. The antique furniture and the care of every detail characterize the atmosphere of this charming location. In summer breakfast is served under the pergola on the terrace, in addition to the fascinating landscape, will be offered local specialties such as ham, cheese and honey from Tuscany, the home-made cakes, fresh fruit, juices, muesli and yogurt. The rooftop swimming pool, with spacious Jacuzzi and open from early May until late September, is immersed in a scene of rare beauty of its landscape typical of the Chianti hills. Derived from the old mill is furnished with original pieces that evoke the spirit of the ancient inns. In winter is heated by a roaring fireplace and in summer we have lunch and dinner at ‘opened on the terrace, where you can enjoy a wonderful view over the hills of Val di Pesa. Few tables, warm and attentive service. To choice of dishes the chef follows the traditional Tuscan recipes, but also his own sensibility and craftsmanship, to bring to the table the flavors true of every season.